Bradley International Airport (ICAO: KBDL, FAA LID: BDL) is a civil/military airport in Windsor Locks on the border with East Granby and Suffield, in Hartford County, Connecticut. Owned and operated by the Connecticut Airport Authority, it is the second-largest airport in New England. The airport is about halfway between Hartford and Springfield. It is Connecticut's busiest commercial airport with 350 daily operations and the second-busiest airport in New England after Boston's Logan International Airport. The four largest carriers at Bradley International Airport are Southwest Airlines, Delta Air Lines, JetBlue Airways and American Airlines with market shares of 28%, 15%, 11% and 10% respectively. As a dual-use military facility with the U.S. Air Force, the airport is also home to Bradley Air National Guard Base and the 103d Airlift Wing (103 AW) of the Connecticut Air National Guard. In 2008 Bradley was the 55th busiest airport in the United States by number of passengers enplaned. Bradley is branded as the "Gateway to New England" and is home to the New England Air Museum, and North America's only Flight Simulation conference, FlightSimCon. The National Plan of Integrated Airport Systems for 2011–2015 categorized it as a primary commercial service airport (more than 10,000 enplanements per year). The now defunct Bradlees department store chain was named after the airport, when investors held a meeting there. Bradley has its origins in the 1940 acquisition of 1,700 acres (690 ha) of land in Windsor Locks by the State of Connecticut. In 1941 this land was turned over to the U.S. Army, as the country began its preparations for the impending war. The airfield was named after 24-year-old Lt. Eugene M. Bradley of Antlers, Oklahoma, assigned to the 64th Pursuit Squadron, who died when his P-40 crashed during a dogfight training drill on August 21, 1941. The airfield began civil use in 1947 as Bradley International Airport. Its first commercial flight was Eastern Air Lines flight 624. International cargo operations at the airport also began that year. Bradley eventually replaced the older, smaller Hartford-Brainard Airport as Hartford's primary airport. 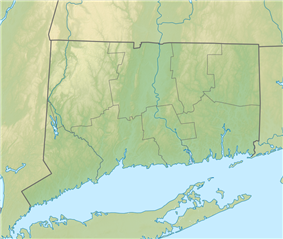 In 1948 the federal government deeded the Airport to the State of Connecticut for public and commercial use. In 1950 Bradley International Airport exceeded the 100,000-passenger mark, handling 108,348 passengers. Former American Airlines gates in Terminal B. In 1952 the Murphy Terminal opened. Later dubbed Terminal B, the terminal was the oldest passenger terminal in the US when it closed in 2010. The April 1957 OAG shows 39 weekday departures: 14 American, 14 Eastern, 9 United and 2 Northeast. Nonstops never reached west of Chicago or south of Washington until Eastern and Northeast began Miami in 1967. Nonstops to Los Angeles and Atlanta started in 1968. In 1960 Bradley handled 500,238 passengers. In 1971 the Murphy Terminal was expanded with an International Arrivals wing. This was followed by the installation of Instrument Landing Systems on two runways in 1977. In 1976 an experimental monorail was completed to link the terminal to a parking lot seven-tenths of a mile away. The "people mover" cost US$4 million and was anticipated to cost $250 thousand annually to operate. Due to the high anticipated operating cost the monorail was never put in service and was dismantled in 1984 to make room for a new terminal building. The retired vehicles from the system are now on display at the Connecticut Trolley Museum in East Windsor, CT. In 1979 the "Windsor Locks" tornado ripped through the eastern portions of the airport. The New England Air Museum sustained some of the worst damage. It reopened in 1982. In 1986 new Terminal A and Bradley Sheraton Hotel were completed. The Roncari cargo terminal was also constructed. In 2001 construction began on a new parking garage. When completed, the garage could not immediately be used. The September 11, 2001 attacks led to regulations requiring parking structures to be set back farther from the tarmac. After opening, for several weeks every vehicle had to be individually inspected, severely reducing its value. Bradley eventually received a waiver for normal operation of the garage from the Department of Homeland Security. 2001 also saw the commencement of the Terminal Improvement Project to expand Terminal A with a new concourse, construct a new International Arrivals Building and centralize passenger screening. The airport expansion was part of a larger project to enhance the reputation of the Hartford metropolitan area as a destination for business and vacation travel. 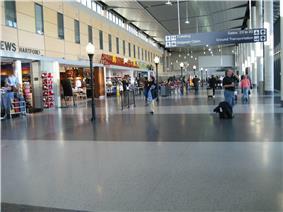 The new East Concourse, designed by HNTB, opened in September 2002. 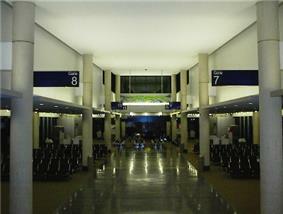 In December 2002, a new International Arrivals Building opened west of Terminal B. This structure houses the Federal Inspection Station and has one jetway for deboarding aircraft. Two government agencies support the facility; U.S. Customs and Border Protection and the U.S. Department of Agriculture. The FIS Terminal can process more than 300 passengers per hour from aircraft as large as a Boeing 747. This facility cost approximately $7.7 million, which included the building and site work, funded through the Bradley Improvement Fund. Currently the International Arrivals Building is utilized by Delta Air Lines and Frontier Airlines (Apple Vacations) for their seasonal service to Cancun, Mexico and Punta Cana, Dominican Republic. All international arrivals except for those from airports with customs preclearance are processed through the IAB. International departures will be handled from the existing terminal complex. In July 2007, Northwest Airlines began nonstop service from Bradley to Amsterdam's Schiphol Airport, the airline normally flew a Boeing 757-200 but more than once substituted for a slightly larger 757-300. It was Bradley's only overseas flight. The flight ended in 2009. On October 2–3, 2007, the Airbus A380 visited Bradley on its world tour, stopping in Hartford to showcase the aircraft to Connecticut workers for Pratt & Whitney and Hamilton Sundstrand, both divisions of United Technologies, which helped build the GP7000 TurboFan engines, which is an option to power the aircraft. Bradley Airport is one of only 68 airports worldwide large enough to accommodate the A380. No carriers provide regular A380 service to Bradley, but the airport occasionally is a diversion airfield for JFK-bound A380s. On October 18, 2007, Bradley International Airport was named one of the top five small airports in the North American Airport Satisfaction Study by J. D. Power and Associates. On October 7, 2008, Embraer, an aerospace company based in Brazil, selected Bradley as its service center for the Northeastern United States. An $11 million project was begun with support from teams of the Connecticut Department of Transportation and Connecticut's Economic and Community Development. The center is intended to be a full maintenance and repair facility for its line of business jets and is expected to employ up to 60 aircraft technicians. The facility was temporarily closed ten months after opening due to economic conditions, reopening on February 28, 2011. On June 21, 2011, the new Boeing 747-8 stopped at Bradley on its introductory world tour, it was the 747-8F cargo variant. On June 22, 2012, the Connecticut Airport Authority board approved the hiring of Kevin A. Dillon as the Executive Director for the Connecticut Airport Authority including Bradley International Airport. Executive Director Dillon plans to continue the development of airport facilities, as well as the establishment of new routes. On October 21, 2015, Bradley announced renewed transatlantic service, partnering with Aer Lingus to bring daily flights between Bradley and Dublin. Bradley International Airport covers 2,432 acres (984 ha) at an elevation of 173 feet (53 m). It has three asphalt runways: 6/24 is 9,510 by 200 feet (2,899 x 61 m); 15/33 is 6,847 by 150 feet (2,087 x 46 m); 1/19 is 4,268 by 100 feet (1,301 x 30 m). In the year ending June 30, 2011 the airport had 107,404 aircraft operations, average 294 per day: 52% airline, 27% air taxi, 17% general aviation and 3% military. 56 aircraft were then based at this airport: 52% jet, 30% military, 12% multi-engine, 4% helicopter and 2% single-engine. Looking down the East concourse. Artwork is changed each season. Terminal B, the 1952 Murphy Terminal, was closed to passenger use on April 15, 2010. The structure continues to host RON (Remain OverNight) aircraft. Plans call for the eventual replacement of the Murphy Terminal with a new 19-gate Terminal B. All international arrivals (except flights with customs preclearance) are handled at the International Arrivals Building, located to the west of Terminal B. This building was formerly used by Northwest Airlines between 2007 and 2009 when they offered non-stop flights from Bradley to Amsterdam. Today, Delta is the sole operator using the IAB. Nonstop destinations from BDL as of September 2014. In addition to the regular cargo services described above, Bradley is occasionally visited by Antonov An-124 aircraft operated by Volga-Dnepr Airlines, Polet Airlines and Antonov Airlines, transporting heavy cargo, such as Sikorsky helicopters or Pratt & Whitney engines internationally. 103d Airlift Wing (103 AW) "Flying Yankees"
118th Airlift Squadron (118 AS): operates the C-130 Hercules. The squadron was previously designated as the 118th Fighter Squadron and operated the Fairchild A-10 Thunderbolt II close air support aircraft from the mid 1970s to 2007. Between 2007 and 2013, the squadron operated the C-21. 169th Aviation Regiment, 104th Aviation Regiment, 142nd Aviation Regiment. Army Aviation Support Facility and the Army Aviation Readiness Center provides aviation support to Army Operations, MedEvac and Air Assault missions throughout the world. Flying UH60 BlackHawks, CH47 Chinooks, C12 Fixed Wing. The Connecticut Wing Civil Air Patrol 103rd Composite Squadron (NER-CT-004) operates out of the airport. On July 3, 2012 the Connecticut Department of Transportation released an Environmental Assessment and Environmental Impact Evaluation, detailing a proposal to replace the now-vacant Terminal B. Construction of a new 7-level parking garage and consolidated car rental facility, adding 2,600 public parking spaces and 2,250 rental car spaces. Demolition of the existing Terminal B, realignment of surface roads and construction of the new garage/rental car facility would occur during the initial phase. The initial phase is estimated to cost between $630 and $650 million. Construction of part of Terminal B and its upper roadway would occur in a second phase, with an estimated completion date of 2018. Construction of the final segment of Terminal B and its upper roadway would occur in a third phase, with an estimated completion date of 2028. Actual completion dates could vary due to funding and demand. Amtrak trains serve both the nearby Windsor Locks and Windsor stations. The New Haven–Hartford–Springfield commuter rail line, which is expected to begin service in 2016, will increase the speed, frequency and reliability of trains along the corridor. Presently, 12 trains serve Windsor Locks station daily. This is expected to increase to 32 in 2016 and 70 by 2020. Plans call for every train at Windsor Locks Station to be met by a shuttle bus connection directly to and from the terminal. Officials have discussed plans to construct a fixed rail link to the airport. Connecticut Transit route 34 provides local service connecting Bradley with Windsor and Hartford. Route 30 (the "Bradley Flyer") provides express service to downtown Hartford. The Connecticut Air National Guard 103d Airlift Wing leases 144 acres (0.58 km2) in the southwest corner of the airport for their Bradley ANG Base. The base is a designated Superfund site. Bradley has also been identified as one of the last remaining tracts of grassland in Connecticut suitable for a few endangered species of birds, including the upland sandpiper, the horned lark, and the grasshopper sparrow. On March 4, 1953 a Slick Airways Curtiss-Wright C-46 Commando N4717N on a cargo flight from New York-Idlewild Field crashed. Bradley was experiencing light rain and a low ceiling at the time of the incident. After being cleared to land on Runway 06, the pilot reported problems intercepting the localizer, and continued to circle down to get under the weather. The plane struck trees approximately 1.6 miles (2.6 km) southwest of the airport, killing the crew of two. On July 16, 1971 a Douglas C-47B N74844 of New England Propeller Service crashed on approach. The aircraft was on a ferry flight to Beverly Municipal Airport, Massachusetts when an engine lost power shortly after take-off due to water in the fuel. At the time of the accident, the aircraft was attempting to return to Bradley Airport. On May 3, 1991 a Ryan International (wet-leased by Emery Worldwide) Boeing 727-100QC, N425EX, caught fire during take-off. The take-off was aborted and the three crew members escaped, while the aircraft was destroyed by the fire. The fire was determined to have started in the number 3 engine. It was determined that the 9th stage HP compressor had ruptured. On November 12, 1995 an American Airlines MD-83, N566AA, crashed while trying to land at Bradley. American Airlines flight 1572 was substantially damaged when it impacted trees while on approach to runway 15 at Bradley International Airport. The airplane also impacted an instrument landing system antenna as it landed short of the runway on grassy, even terrain. The cause of the accident was determined to be the pilot's failure to reset the altimeter, however, severe weather may have played a factor. One of the 78 passengers was injured. On January 21, 1998 a Continental Express ATR-42, N15827, had an emergency during roll on landing. During the landing roll, a fire erupted in the right engine. The airplane was stopped on the runway, the engines were shut down and the occupants evacuated. The fire handles for both engines were pulled and both fire bottles on the right engine discharged. However, the fire on the right engine continued to burn. The airport fire services attended shortly afterward and extinguished the fire. Previously marketed by defunct Skybus Airlines as "Hartford (Chicopee, MA)". ^ a b c d FAA Airport Master Record for BDL (Form 5010 PDF). Federal Aviation Administration. Effective November 15, 2012. ^ Hanseder, Tony. 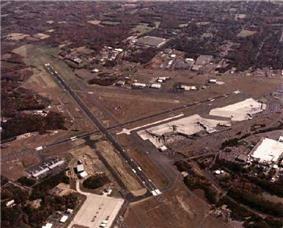 "Hartford Bradley BDL Airport Overview". Retrieved September 20, 2012. ^ a b "Hartford, CT Bradley International FACTS". Research and Innovative Technology Administration. Retrieved July 3, 2012. ^ RITA | BTS | Transtats. Transtats.bts.gov. Retrieved on July 15, 2013. ^ "2008 Passenger Boarding Statistics" (PDF). ^ "2011–2015 NPIAS Report, Appendix A" (PDF, 2.03 MB). National Plan of Integrated Airport Systems. Federal Aviation Administration. October 4, 2010. ^ a b c d e f g h "Media Kit Fact Sheet". Bradley International Airport. Retrieved October 9, 2010. ^ Marks, Paul (May 28, 2006). "Archaeological Sleuths Hunt For Site of Bradley Airport Namesake's Fatal Crash". Hartford Courant. Retrieved November 14, 2011. Bradley's fatal accident occurred during a simulated aerial dogfight with Frank Mears, commander of the 64th Pursuit Squadron. The plane Bradley was flying spun out of control as he went into a sharp turn at about 5,000 feet. Stunned witnesses saw the plane spiral slowly into a grove of trees. Soon a column of smoke arose. They theorize that the young pilot blacked out from the gravitational forces felt during such a sharp aerial turn. ^ Gershon, Eric (April 2, 2010). "Airlines To Clear Out of Bradley Airport's Murphy Terminal, The Nation's Oldest, By April 15". Hartford Courant. Retrieved October 9, 2010. ^ Marks, Paul. "Bradley: From Field To High-flying Hub", The Hartford Courant, October 26, 2003. Accessed January 26, 2013. ^ Hopetunnel.org, "Bradley International Airport People Mover at the Connecticut Trolley Museum", August 3, 2002. Accessed January 26, 2013. ^ Bradley Airport Master Plan. Bradley International board of directors. ^ "Fact Sheet: Federal Inspection Station" (PDF). Bradley International Airport. Retrieved October 9, 2010. ^ "Bradley loses flight to Europe again", Associated Press via WTNH.com, March 27, 2009. Retrieved August 6, 2012. ^ "Emirates 201 A380 departing BDL for JFK". September 21, 2014. Retrieved September 30, 2014. ^ Gershon, Eric (August 26, 2009). "Embraer Closes Jet Maintenance Center at Bradley Airport Months After Opening". Hartford Courant. Retrieved October 9, 2010. ^ Seay, Gregory (March 1, 2011). "Brazil's Embraer reopens at Bradley". Hartford Business Journal. Retrieved March 31, 2011. ^ Smith, Larry (June 21, 2012). "Airport Authority Board Formally Approves Hiring Executive Director". Windsor Locks-East Windsor Patch. Retrieved July 3, 2012. ^ a b c "Environmental Assessment and Environmental Impact Evaluation, New Terminal B Passenger Facility and Associated Improvements at Bradley International Airport Windsor Locks, Connecticut" (PDF). Connecticut Department of Transportation. Retrieved July 3, 2012. ^ "Announcing Three New Ways to the USA for 2016". Aer Lingus. 21 October 2015. Retrieved 21 October 2015. ^ "Routes & Schedules". Connecticut Transit. Retrieved February 11, 2010. ^ "Grasslands". Audubon Connecticut. Retrieved July 3, 2012. ^ "N4717N Accident description". Aviation Safety Network. Retrieved October 9, 2010. ^ "N47844 Accident description". Aviation Safety Network. Retrieved September 19, 2010. ^ "N425EX Accident description". Aviation Safety Network. Retrieved October 9, 2010. ^ "N56AA Accident description". Aviation Safety Network. Retrieved October 9, 2010. ^ "N15827 Accident description". Aviation Safety Network. Retrieved October 9, 2010.